Thomas missed a big chunk of his childhood. It was a daunting proposition for the family to bring him home from the hospital without the support of inpatient treatment. When Kathleen discovered Hope Reins, she thought her son’s affection for animals could be used as a different kind of prescription for hope. She was right. 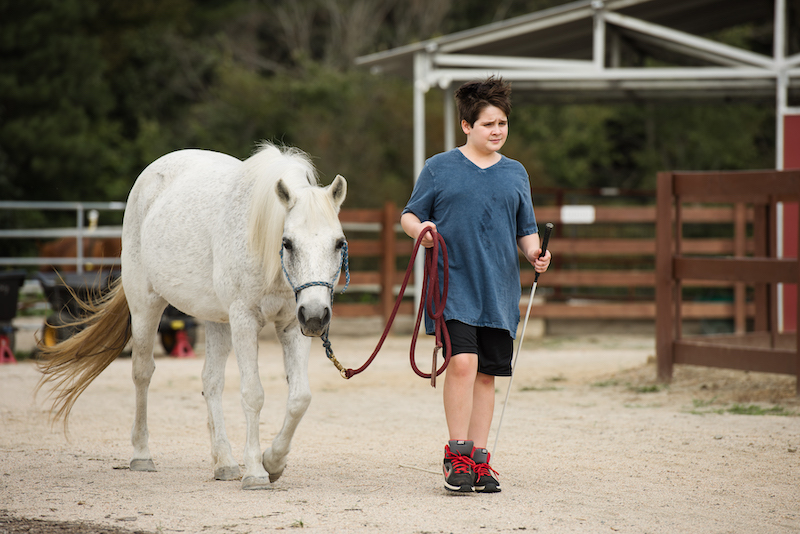 He made a friend at summer camp, began leading other kids in prayer and recently experienced the tranquility of foot soaking alongside Shiloh, whose hooves are immersed daily in water and Epsom salt to alleviate painful inflammation from laminitis. Would you consider making a donation towards Kairos Kids like Tommy? Would you consider becoming a monthly horse sponsor, making a one-time donation, or joining our mailing list and donating your time toward our ministry helping hurting kids find true hope and real healing?